A French Quarter courtyard discovered during our French Quarter walking tour. New Orleans is a city of history and stories and locals who want to share those stories with visitors. One of our walking tour guides said it could take months, if not years, for her to share everything we would need to know to understand New Orleans. While travelers can certainly soak up New Orleans’ historic architecture, friendly people, mouthwatering food, tasty cocktails, and soul-stirring music while walking the streets of New Orleans on their own, they might miss the history and stories that define New Orleans. Taking one or more of New Orleans’ walking tours will acquaint visitors with the pieces of past and present that make New Orleans the city it is today. Here are some of the best walking tours of New Orleans and just a few highlights of what you can learn from them. New Orleans was founded in the early 1700s by Jean-Baptiste Le Moyne de Bienville, and the city did not expand past the borders of the French Quarter for nearly a century. Today the entire French Quarter district is on the National Register of Historic Places. The site of the city was chosen because it is on the shores of the Mississippi River, through which the waters from 31 states drain, and the land in this small area is on slightly higher ground created by river silt buildup, which is why the French Quarter remained comparatively undamaged when the levies of New Orleans broke during Hurricane Katrina. A French Quarter walking tour educates travelers on the history of the French Quarter from the very beginning. Bourbon Street – Some may think Bourbon Street is named after the alcohol because of its reputation for being a popular drinking spot. However, Bourbon Street had its name way before the bars arrived and was actually named after the royal Bourbon Family. Cajun vs. Creole – Creole means native-born, so a creole person was someone born in Louisiana and whose parents were from elsewhere. Today creoles are descendants of these first generation settlers. Cajuns are descendants of French Canadians who came to Louisiana. Cajun and creole cuisine are also different. Creole dishes are many times red because they are tomato-based while Cajun food starts with the holy trinity of bell pepper, onion, and celery, are browner in color, and are spicier. Canal Street, the division between the French Quarter and the English section. French vs. English – The residents of the French Quarter were primarily French. The street names are French. When the English came, they took up residence on the other side of Canal Street to the southwest of the French Quarter. This is why all the street names change once you cross Canal. Canal Street was neutral ground and even today street medians are referred to as neutral ground by residents. Canal Street is 171 feet wide and was originally meant to be a canal. The former residence of playwright Tennessee Williams. A Streetcar Named Desire – A Streetcar Named Desire was written by Tennessee Williams in the French Quarter. The Desire streetcar line used to run through the French Quarter. The play was originally named The Poker Night, but was renamed to A Streetcar Named Desire, referencing this New Orleans streetcar line. Great New Orleans Fire – Much of the French Quarter was consumed by fire in 1788. 856 buildings including the church were destroyed. The fire occurred on Good Friday so the church bells could not be rung to sound the alarm. Many of the buildings were made with cypress wood façades and the buildings were demolished within hours. The Spanish replaced them with brick structures with inner courtyards, and these are the buildings that define French Quarter architecture. In case you were wondering, all those balconies are called galleries if they are held up by posts that reach the ground. Balconies are supported by brackets. Short-Favrot House with a cast-iron cornstalk fence. A Garden District Walking Tour explores the Lafayette Cemetery #1 and the architecture of the Garden District homes along with a little peek into the lives of the rich and famous residents. Lafayette Cemetery No. 1 – The Lafayette Cemetery, opened in 1833, is one of New Orleans’ many above-ground cemeteries. New Orleans’ cemeteries are above-ground because the underground water is so close to the surface. Because the people of New Orleans were Catholic, they couldn’t cremate their deceased, so family tombs were used. One of the Lafayette Cemetery tombs has been used by a family since 1858. More people are born, live, and die in New Orleans than other places, so many generations of a family use the same tomb. Shotgun Houses – Shotgun houses are narrow rectangular houses. They are so named because you can shoot a gun through the front door and the bullet will pass through all the rooms and exit the back door without hitting a wall. They didn’t provide much privacy, but rather were built for airflow. Double shotgun houses are duplexes, usually occupied by the same family. Filming location for The Curious Case of Benjamin Button. Benjamin Button House – The Curious Case of Benjamin Button was filmed at 2707 Coliseum Street. The house is an example of Greek revival architecture from the late 1840s. Greek revival architecture buildings are symmetrical with columns and galleries and are painted white with black shudders and trim. In front of the home is a large cement block used for getting into carriages. Sandra Bullock House – Sandra Bullock’s house is nearby at 2627 Coliseum Street. Her home is dark green with cast iron and large hedges blocking the view. John Goodman House – John Goodman’s house is found at 2425 Coliseum Street. It was previously owned by Trent Reznor of the Nine Inch Nails. The underside of the gallery is painted New Orleans Blue, which is said to keep out ghosts and wasps. The home of Edgar Degas' uncle Michael Musson. Musson-Bell House – This large pink house at 1331 3rd Street was built by Michael Musson, a cotton merchant who may be better known as the uncle of artist Edgar Degas. Musson’s blind daughter, Estelle, married her first cousin and Edgar Degas’ brother, René de Gas. Estelle’s friend and neighbor came to read to her frequently. René de Gas eventually ran off with Estelle’s friend. Musson adopted Estelle and René’s surviving children and changed their last names. Anne Rice House – Anne Rice, the author of The Vampire Chronicles, used to live at 1239 First Street. The residence is transitional in style, which means it is a mix of styles, in this case Italianate and Greek revival. The house features a Greek keyhole doorway and cast iron that upon close inspection looks like either Carmen Miranda or a skull. Archie Manning House – While I’m not much of a football fan, I am a Peyton Manning fan, so I was very excited that our Garden District walking tour included a pass by the Peyton family home at 1420 First Street. Residents remember the Manning boys playing in the streets as children. The cemetery voodoo walking tour visits another above-ground cemetery in New Orleans, St. Louis Cemetery No. 1. This cemetery opened in 1789 and has some famous residents including Marie Laveau, Madame LaLaurie, and eventually Nicolas Cage. Our Lady of Guadalupe Chapel – Our Lady of Guadalupe Chapel was first built in 1826 as a mortuary chapel. To the left of the altar is the St. Jude Shrine, which contains a relic of St. Jude. Don’t be surprised to find homeless people sleeping on the pews. Marie Laveau – Marie Laveau was a yellow fever nurse, a free woman of color, and a Catholic. She is known as the Voodoo Queen of New Orleans because she used roots and herbs for homeopathic cures. In New Orleans voodoo was holistic and positive. She married Jacques Paris, a free man from Haiti. When he died she began calling herself Widow Paris. She later began a relationship with Louis Christophe Dominick Duminy de Glapion, a white man, with whom she had seven children, two of which survived. When she died some called her a saint while others called her a witch. She is buried in her family's tomb. Madame LaLaurie – Marie Delphine Lalaurie was a Louisiana-born socialite. It is known that she badly mistreated her slaves. It is believed she tortured and murdered slaves. She self-exiled to France and died in Paris, but she is buried in St. Louis Cemetery #1. Nicolas Cage – For some reason Nicolas Cage has a love affair with New Orleans. He has owned multiple homes in the city, though those were lost in foreclosure. He now rents a place in the French Quarter. However, he does still own a small piece of New Orleans land in the form of a tomb in St. Louis Cemetery #1. I’ve always been a fan of Nicolas Cage (I know, feel free to mock me), but seeing his Masonic style nine-foot deep pyramid tomb in the middle of the St. Louis Cemetery made me very sad. It is said no respect was given during the building of his tomb to his cemetery neighbors. Other tombs were injured during the process and the pyramid is completely out of place in this historic cemetery. Easy Rider Tomb – The New Orleans Italian Mutual Benevolent Society tomb was designed in 1857 by architect Pietro Gualdi. What most people recognize it from is the movie Easy Rider, when Peter Fonda sat on the statue of Italia. The group tomb has 24 separate openings. Homer Plessy – Another resident of the St. Louis Cemetery is Homer Plessy. Homer Plessy was a free man of color born during the Civil War. He was seven-eighths of European descent and one-eighth of African descent, but was still classified as black. He was arrested for sitting in a “white only” train car. He took his case all the way to the Supreme Court. Unfortunately the Plessy v. Ferguson decision in 1896 resulted in the separate-but-equal doctrine, allowing segregation to be the law. This doctrine remained until 1954, when it was overturned by Brown v. Board of Education. New Orleans is famous for its cocktails. A New Orleans cocktail tour will introduce you to the many cocktails of New Orleans and some of the best places to find them. We joined the original cocktail tour of New Orleans with Gray Line, where everyone starts with a welcome drink in a go-cup and then visits bars around the city with the opportunity to purchase additional cocktails. The Court of Two Sisters – The Court of Two Sisters is a restaurant which used to be a notions shop owned by two sisters who died within two months of each other in 1944. Outdoor diners are shaded by a 100-year-old Wisteria tree in a courtyard that may be the largest in New Orleans. The cocktail featured at The Court of Two Sisters was the Bayou Bash, a Southern Comfort, juice, and wine drink poured in layers and which tastes like sangria. Broussard’s – Broussard’s is one of New Orleans’ famous old-line creole restaurants. This restaurant has the oldest living Wisteria in the French Quarter. Paul Gustings, a 35-year bartender, poured two classic New Orleans cocktails, the Pisco Punch and the Hurricane. The bar also offers Absinthe service. Arnaud’s – Arnaud’s, another old-line creole restaurant, has two bars, French 75 and the Richelieu Bar. While French 75 is the more popular bar, the Richelieu Bar is actually the original bar of Arnaud’s. The drinks offered here were two more classics, the French 75 and the Sazerac, the official cocktail of New Orleans. We took our French Quarter, Garden District, and Cemetery Voodoo walking tours with Historic New Orleans Tours, Inc. Tours are small and cost $20 per person. Reservations are not required. Guests can just show up at the pre-determined meeting place. If a lot of people show up, the tour guide will call in for another so groups can be split and kept small. 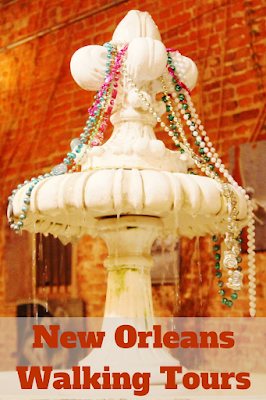 Historic New Orleans Tours, Inc. also offers a cocktail tour and a haunted tour. We took the Gray Line New Orleans’ Original Cocktail Walking Tour as it is the original cocktail tour of New Orleans. Guided walking tours of the French Quarter and Garden District are also included with the City Sightseeing New Orleans Unlimited Hop-On Hop-Off bus ticket.